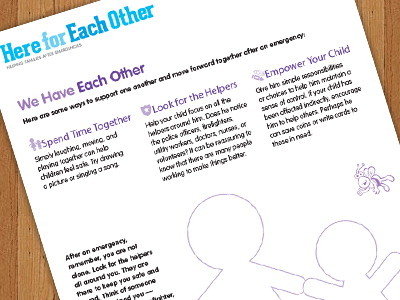 Emergencies can be overwhelming, particularly for young children. Even in the most difficult of circumstances, families can find strength and resilience within their community. 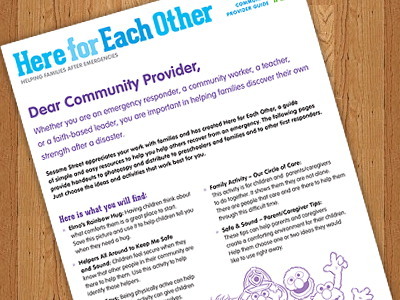 As a provider, you are important in keeping families connected and helping them discover their own strength after a disaster. 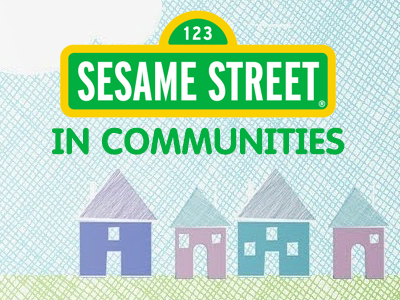 Sesame Street appreciates your work with families and has created this Community Guide with simple and easy resources to help you help others recover from an emergency. 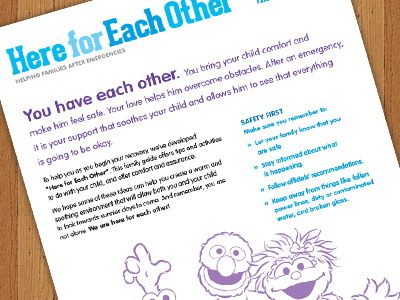 After an emergency, it is your support that your child and allows him to see that everything is going to be okay. To help you as you begin your recovery, we've developed Here for Each Other. 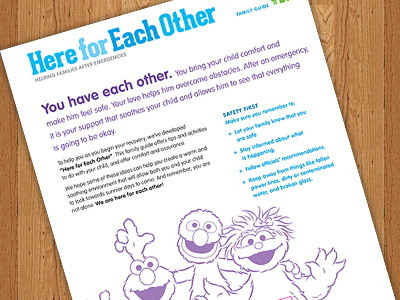 This family guide offers tips and activities to talk with your child, assess how she's doing, and offer comfort and assurance. Assure your child that she is safe and loved. Holding a comfort item, like a blanket or toy, may also help. There is comfort in the familiar, especially after a disaster. Choose at least one routine that you can keep even if your situation or location changed. 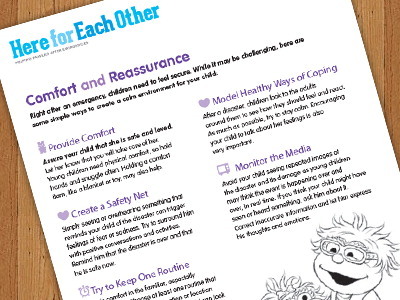 After a disaster, children look to the adults around them to see how they should feel and react. As much as possible, try to stay calm. It's also okay for your child to see you cry. You can explain that even adults can feel overwhelmed or upset about what happened. Avoid your child seeing repeated images of the disaster and its damage as young children may think the event is happening over and over, in real time. Children might still be confused about what exactly a hurricane is. Explain that it is a big storm with a lot of wind and heavy rain. It can be scary, but adults will do their best to keep children safe. Try to calm your own fears first, since children take your cues. Answer questions honestly and age-appropriately, in simple words. Reassure them that what happened is not their fault, and that you love them and will take care of them. Hugs help, too! Follow your children's lead. They may not want to talk about their emotions and experiences right away. If they prefer not to talk, play with them and spend time doing what they like to do. If they express sadness, anger, or fear, tell them it's okay to feel this way, and encourage them to continue sharing their feelings with words or pictures. As much as possible, try to keep a daily routine. To help children feel calm and safe, encourage them to engage in favorite activities. Simply smiling, laughing, and playing together can also help children feel safe. Encourage them to do things that can help them express their emotions, such as writing a story or drawing a picture. Nightmares, bed-wetting, aggression, inattentiveness, and clinging behavior are common among children who have experienced a crisis. If you notice such signs, please talk to a health care provider, teacher, school counselor, or mental health professional. Avoid having your child watch or see repeated images of troubling events, such as a natural disaster and its damage. Young children might think that the event is happening over and over, in real time. If your children have been directly affected by the hurricane, you can give them simple chores and responsibilities to help them maintain a sense of control. Praise their efforts—building self-confidence is important when joining a new community. 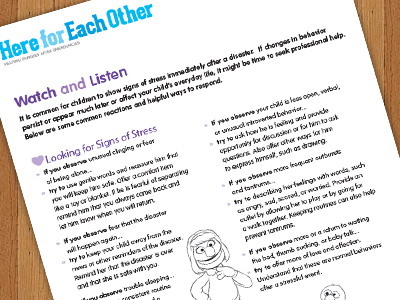 If children have been indirectly affected, encourage them to show compassion and help others. You're more helpful to your children when you've attended to your own physical and emotional needs. Build a support system through relatives, friends, faith leaders, or counselors. Stay active, get enough rest, eat healthfully, and do things you enjoy. Explain that while many things may have changed, there are people and places we can always "hold in our hearts." Explain that no matter what has happened, you still have each other to build a better future. Even in the most difficult of circumstances, families can find strength and resilience within their community. 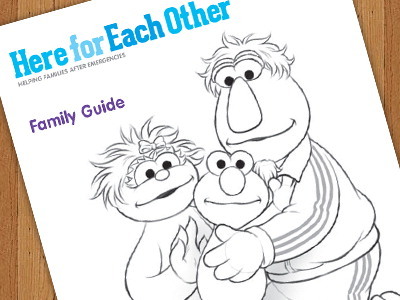 With support by PSEG, Sesame Street developed Here for Each Other, a bilingual resource (English and Spanish) that provides tips, ideas, and activities to help adults and children cope with disasters.